With the 50th anniversary celebration of the Mustang happening in April, Ford Motor Co. decided to prime the pump for the big event one weekend before with a massive presence at the 12th annual Barrett-Jackson Collector Car Auction in Palm Beach, Fla. The assault was multi-faceted: Ford brought in some of its brass for the event, including Vice President, U.S. Marketing, Sales and Service, John Felice (Ford’s top domestic marketing executive) and Steve Ling, Ford car marketing manager who is one of the key architects of the launch of the 2015 Mustang. 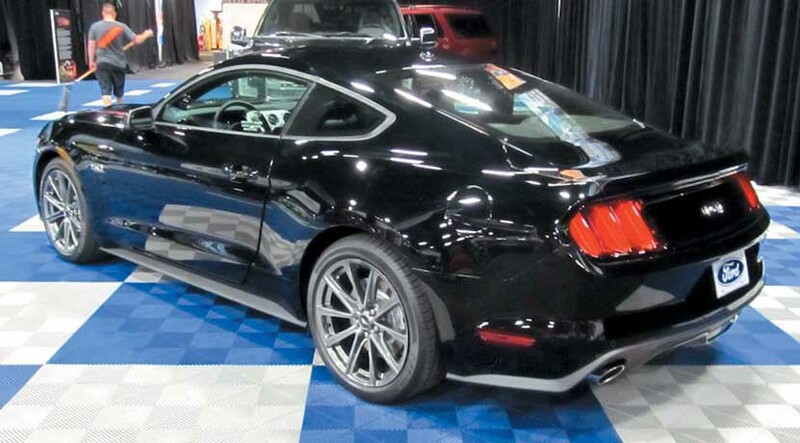 Naturally, Ford had one of its prototype Mustangs on hand, which in this case was a shiny black 2015 GT coupe, in the vendor display area. They also had a celebrity Mustang in the form of the “Need For Speed” 2013 Ford Mustang GT movie car. Heavily patterned after the Shelby GT500 model, this extensively modified Mustang was used in the actual filming of the movie. And it was quite the looker, done up in silver pearl paint with twin “Kona Blue” racing stripes and custom-made 22-inch wheels. It looked really fast, even standing still. 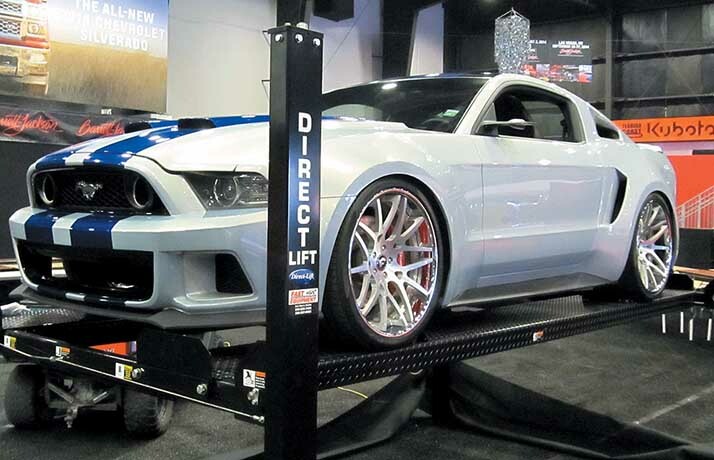 To make sure the movie car got plenty of visibility, it was raised on a car lift and displayed at the opening night Barrett-Jackson gala. 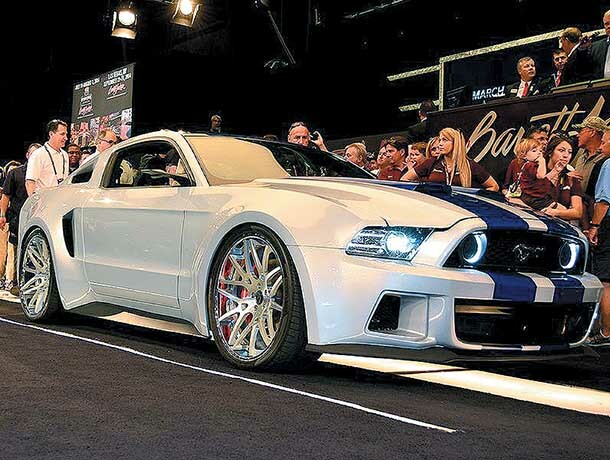 Then on April 12 – Barrett-Jackson Super Saturday – the “Need For Speed” Mustang was auctioned off during FOX’s airing of the event. Under the electric auction atmosphere and the drama of live TV, the car sold for an astounding $300,000 to Dave Flynn of the Flynn Automotive Group in Youngstown, Ohio. All of the proceeds went to benefit the Henry Ford Health System, one of Ford Motor Co.’s favorite charities. Ford’s John Felice drove the car onto the auction block with this reporter live Tweeting from the passenger seat. Not only did the car raise a lot of money for charity, it was something of a social media sensation with Tweets and re-Tweets on the sale coming in from more than 30 countries, including England, Russia, Australia, Thailand, South Africa, Mexico Argentina and Sweden. The Ford executives were highly enthused with the response to both the “Need For Speed” car and the new 2015 Mustang, especially given that Barrett-Jackson was the weekend before massive Mustang celebrations in Charlotte, N.C., and Las Vegas, Nev.
“In a word, electric,” Ling said of the Barrett-Jackson atmosphere. “From the gala that kicked things off at Barrett-Jackson here on Thursday, people seeing the car . . . just the whole thing. It’s a perfect fit for the whole environment of enjoying cars, enjoying the hobby, appreciating the “Need For Speed” car and everything that the game brings to life. It has been fun to see here. Ling said the Mustang’s unique status made the big parties possible. It just shows the kind of passion Mustang brings out,” said Felice. 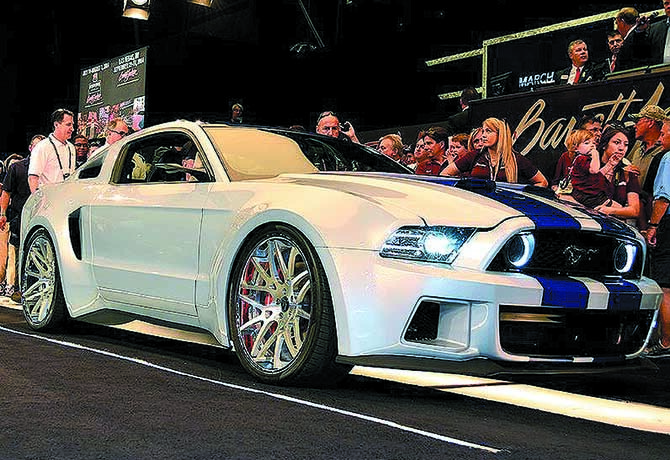 Ford’s Steve Ling said the all-new 2015 Mustang was well-received at the Barrett-Jackson event. 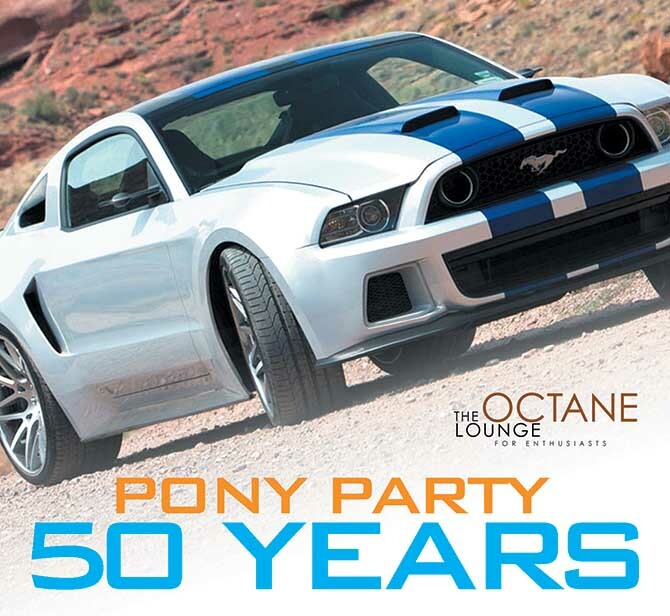 And without question, some of the attendees at the Barrett-Jackson Palm Beach event and the subsequent Mustang shows in Charlotte and Las Vegas are already getting in touch with their local dealers seeing when they can get their hands on 2015 cars. Z06 WILL COME IN A CONVERTIBLE? 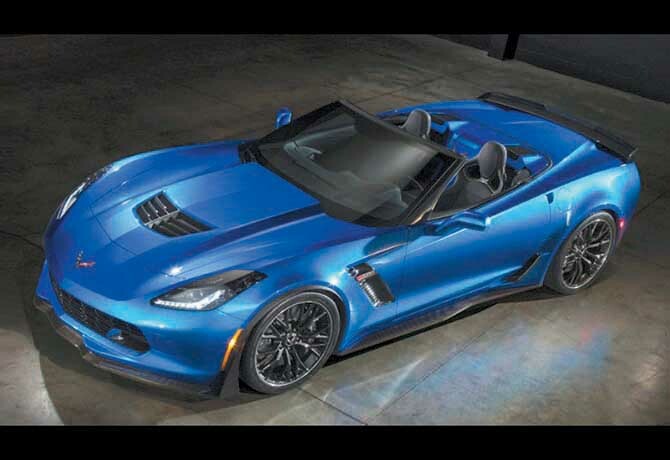 : For the first time since 1963, Chevrolet will offer the ultra-high-performance Z06 Corvette Stingray as a convertible in addition to the coupe, starting with the 2015 model year. Horsepower for the hot rod ‘Vette will be at least 625, with 635 pound-feet of torque. Gearboxes will be a seven-speed manual or an eight-speed automatic. Yes, an automatic. WHY WAIT? : Through August, Dodge will offer a one-year lease on 2014 Chargers and Challengers, with buyers being able to switch to three-year leases on the revised 2015 models with the same payment terms and no additional money down.